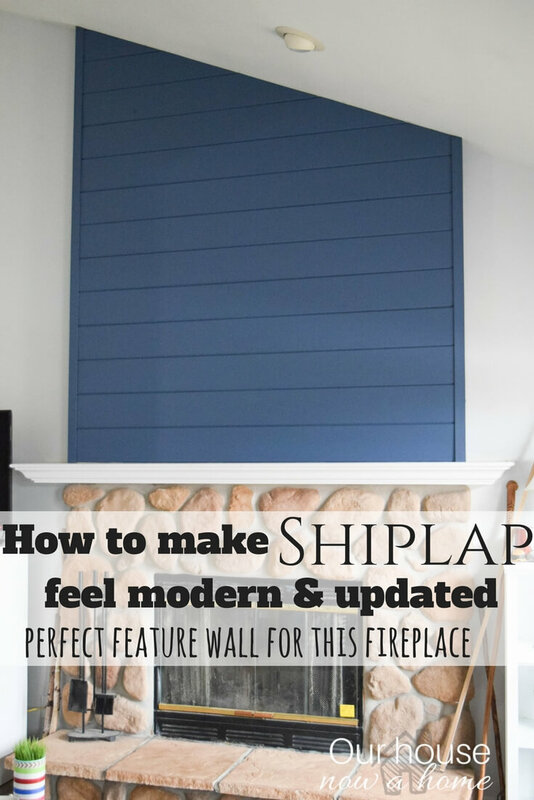 Today is all about showing my home in a new light, I am even showing a room I have never shared on the blog before! 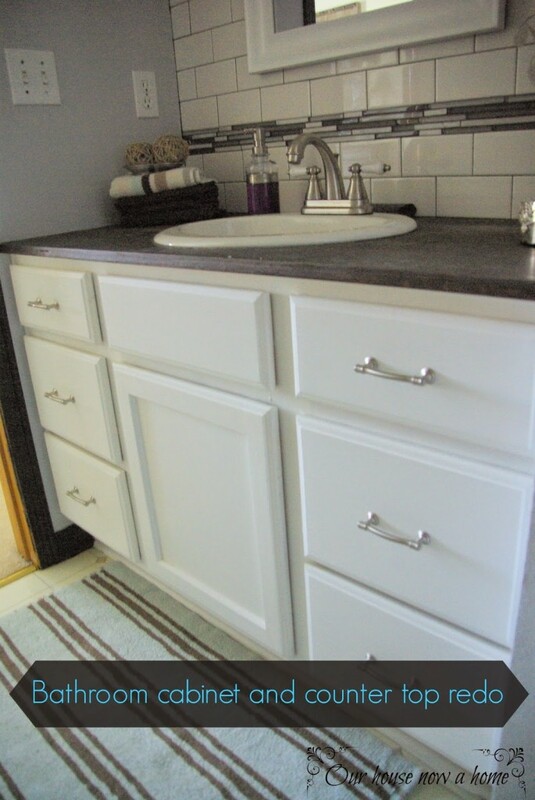 This is the Master Bathroom & kids bathroom tour and ideas – Room By Room series week 6. So once I share my two bathrooms you can look and see the other bloggers with their bathrooms. 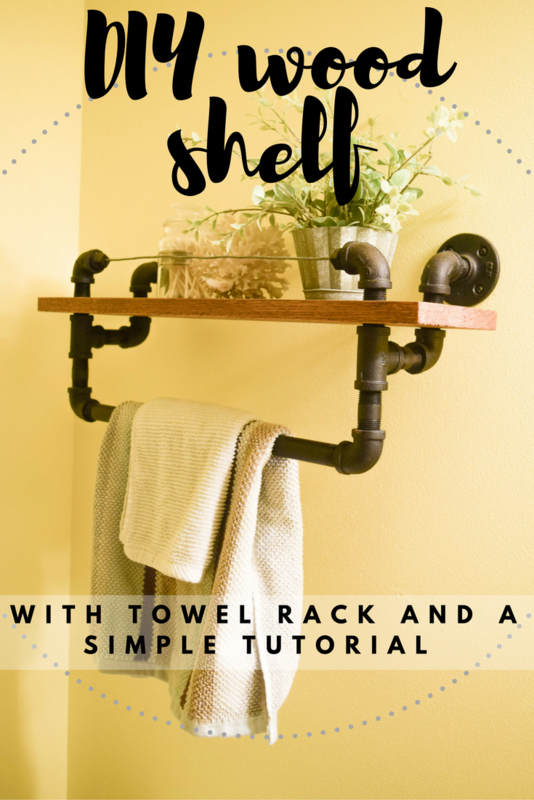 Like I have been doing in all posts with a lot of DIY projects included in the space, I will be sharing all of the DIY projects I did for my bathroom at the bottom of this post. We redid our master bathroom a few years ago, not a full blown renovation; just a little updating. It was a sad, tired, and plain bathroom to begin with. 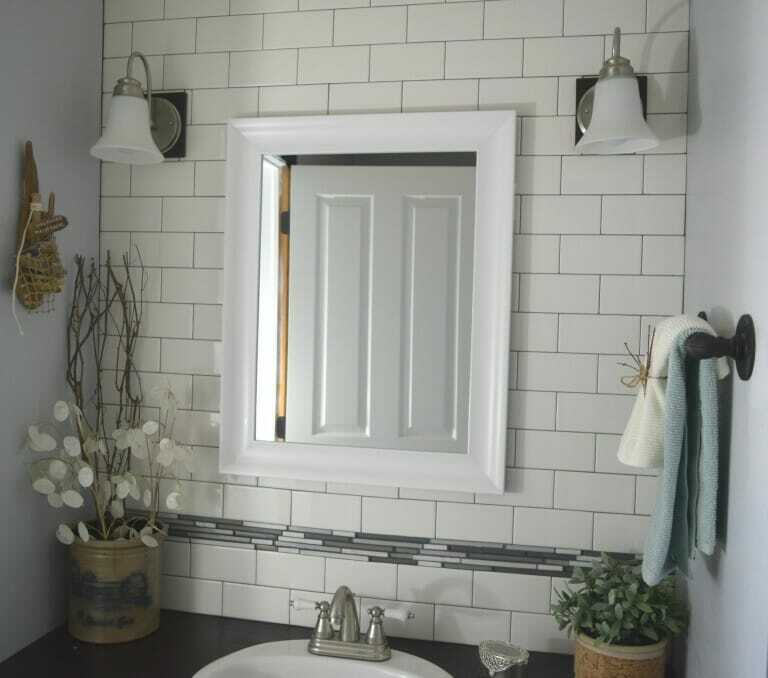 I painted the bathroom cabinets, painted the wall and trim, added a wood butchers block top, changed the lighting, mirror and added a feature wall with subway tile. Would you believe that this all started with plans to paint the walls? It snowballed with each new “little” project that I added. Our master bathroom is tiny, I mean seriously little! Since blowing out some walls was not an option my goal was to make this small space be lighter and brighter. 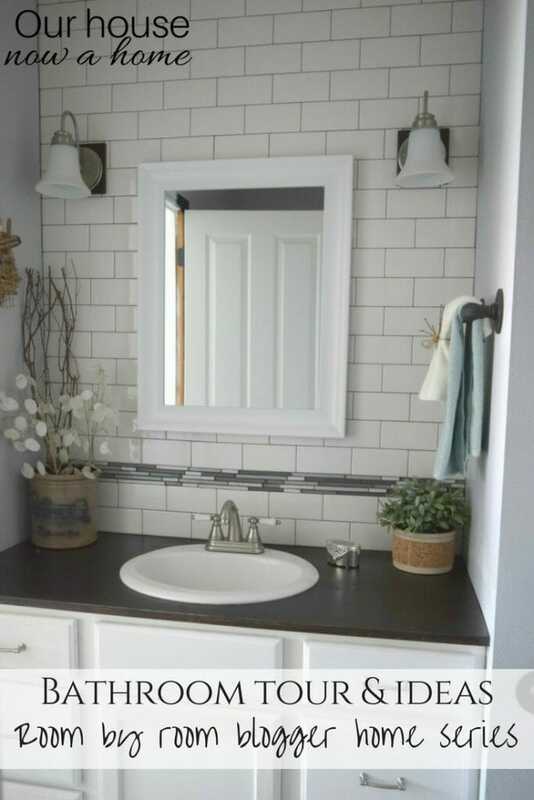 I did that with the wall colors, subway tile and the simple decor in here. There is a small shower in here, that I cannot get into unless the door is shut. Otherwise the shower is inaccessible, I warned you it was tiny! You know those Tiny house TV shows? My master bathroom would fit right in with those tiny spaces. I learned a few tough lessons when we were putting the tile on here and adding the grout. I shared it all in the original tutorial post that can be found at the bottom of this post. I focused most of my energy on this small vanity area. Yes, we (gasp) have made a marriage work with just one sink in our master bathroom. I know, shocking! The few things we did not do in this bathroom was the flooring, it still has the original linoleum. 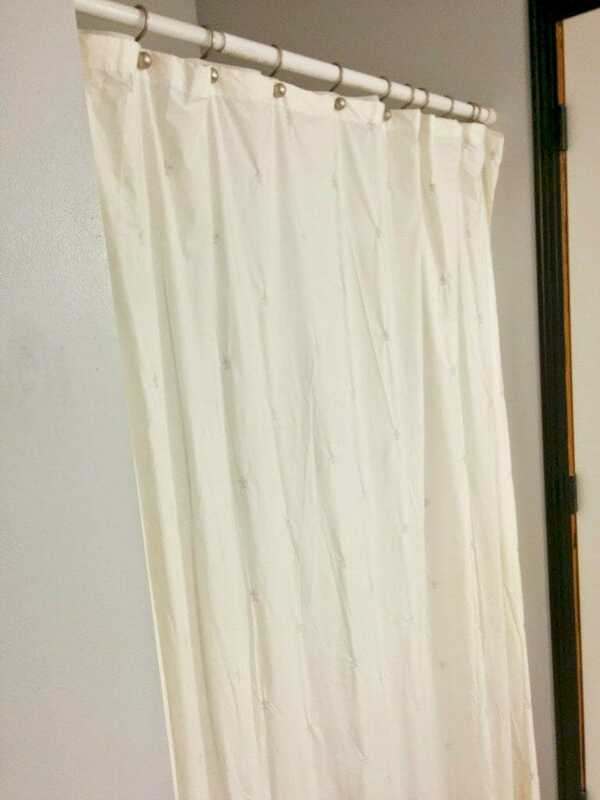 I also did not take out the drop in shower and tile the whole thing. Both of those were on our to-do list, but then Dale and I started thinking about our home long term. 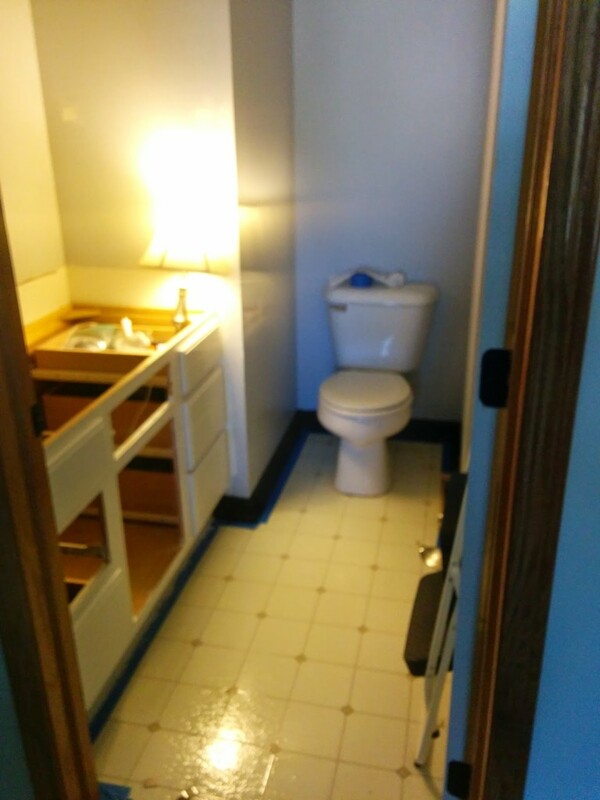 We realized a few different ways that our bathroom and walk-in closet could be reconfigured to give us more space. My goal and dream is to eventually get a big bathtub I can soak in. So we have planned to keep anymore master bathroom renovations on hold for now, and we hope to start tearing down those walls and really shake things up around here to make the bathroom/closet situation really work for us. 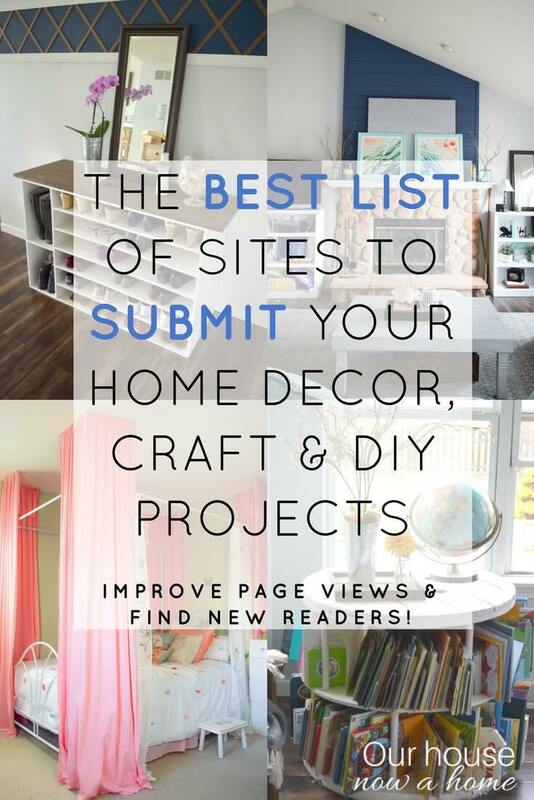 Eeeek, this is where my home decor blogger self hides in shame. This bathroom is rough looking. Nothing is outwardly wrong with it, but aesthetically nothing is really right with it either. 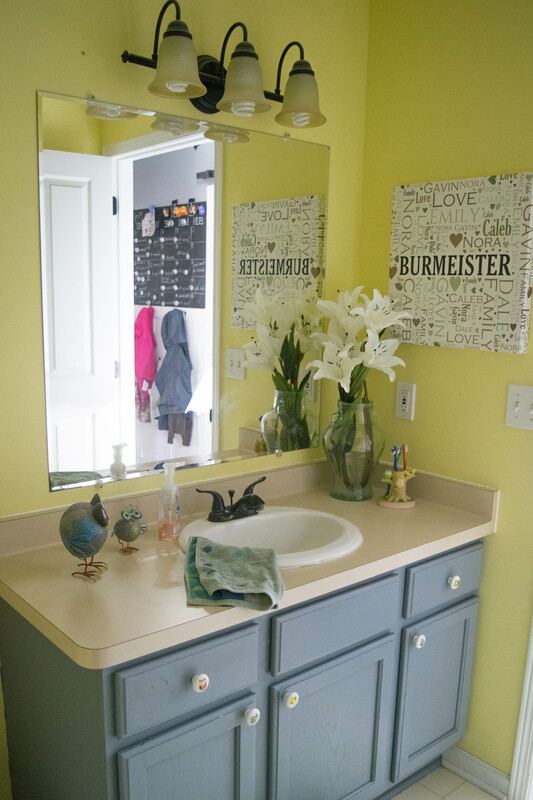 When we purchased this home we painted the walls, the trim white and the vanity cabinet. That is it! 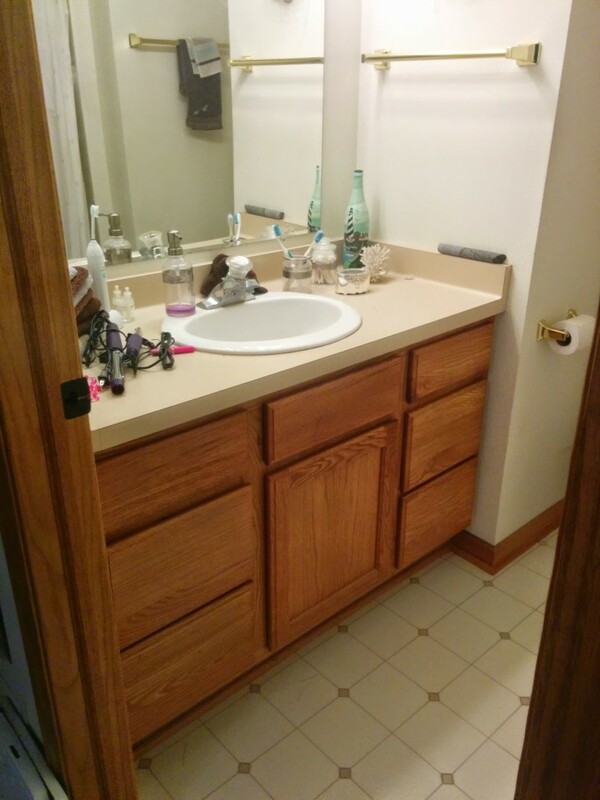 When we had a baby, and then two more in quick succession this space was perfect for those bubble baths, potty training, and constant flooding of water that three kids bring on. I liked the cutsey owl theme and the bold colors and patterns. It felt lively with our tiny and growing family. Now that we have a 9,7 and 6 year old we are finally ready to tackle this room! The first thing to go will be the wall color. My daughter Nora recently said “Mommy, yellow….? Really? I mean, it is like the wall is painted in pee!” Umm, thanks for pointing that out! Technically, anyone who has boys in their house knows that pee is a gross factor of a kids bathroom. But yes, I intentionally chose what was supposed to be a soft yellow. Turns out it was not so soft, and more bright yellow. Always get a paint sample first!!! As I said though, this bathroom has functioned perfectly. It has kept my kids clean, and the layout of it is great. My plans for this is to get either two sinks or one longer sink with two faucets. This way at least two kids can stand at the sink to brush their teeth at once, which causes daily fights with my kids. I suspect they would not be so eager to brush teeth if it was not for the claiming of the sink time. I also want to do something with the bathtub. My kids are past the bath taking phase in childhood and all take showers. I am debating tearing out the bathtub and putting in a huge shower with a glass door and tile. I know for resale purposes that is a massive no-no but we plan to be here for a very long time, this is our forever home. Also, if we go along with the plans for the master bathroom we would have a bathtub in there. Still going back and forth on this though, what do you think? Lastly, updating the flooring, mirror and lighting. Bring it more modern and updated, less basic and cute. This is not only my kids bathroom but the main bathroom that guests use. So going a little less “kid friendly” with the design but still keeping that much sought after function. I still need this bathroom to work well for three kids, and a little girl that is on the cusp of tween years, where I am sure more hair and girl “prep” time will be happening in here. Both of the bathrooms in our home have a ways to go. We have gotten years out of the light and bright master bedroom updating I did. Once we get the time and plans organized to overhaul the closet/bathroom area in our bedroom it will be amazing. Just have to get there. The hallway bathroom has a ton of needs, and I still need to decide exactly what I want to do in here. These bathrooms are really the roughest spaces in my home, the least “done”. I will get there, I just need more time, money, skills, and to finally pick the plans, layout and designs for the room. No biggie! 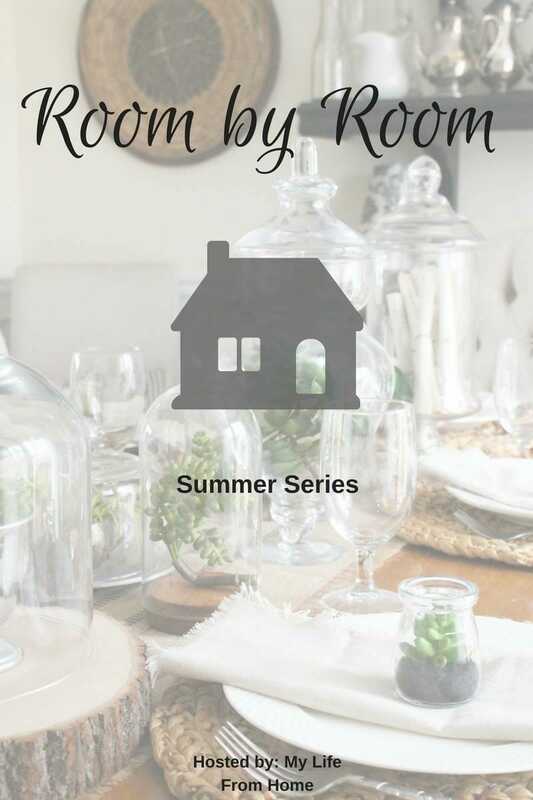 I hope you enjoyed seeing these Master Bathroom & kids bathroom tour and ideas – Room By Room series week 6, decorating a home is a process and mine is still in the beginning stages. I have rooms that are almost completely done, some in the process and a few that have not been touched. We will get there, and you all are along for the ride! 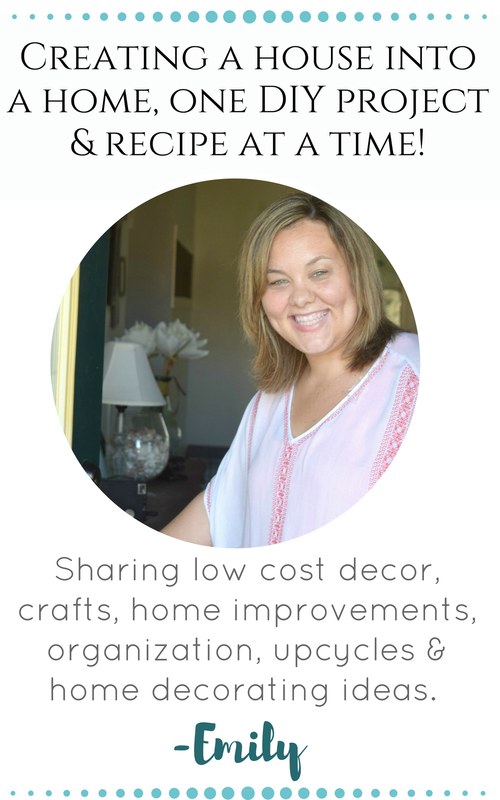 I have said that this blog is about making my house and yours a home, one DIY project at a time. Looking at these bathrooms of mine, the proof of work yet to do is very obvious! 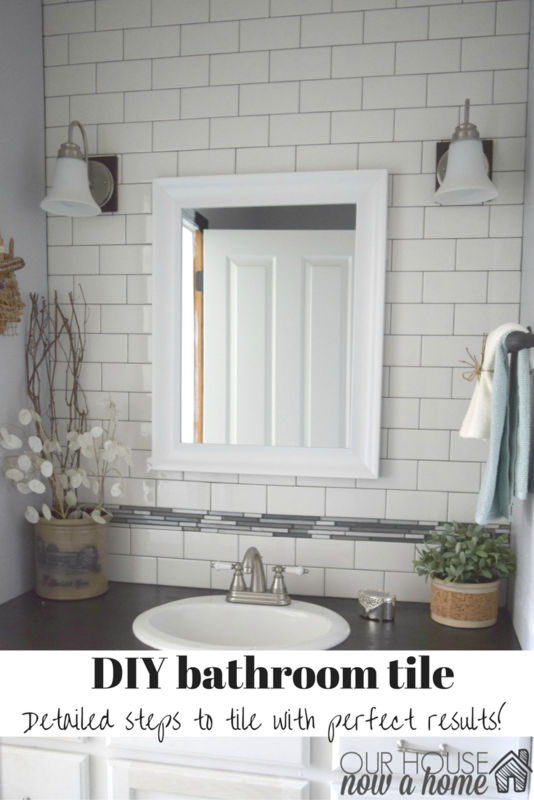 Be sure to visit all of the other bloggers linking up and sharing their bathrooms! 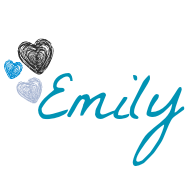 Wow Emily – your DIY projects are always so impressive! Your master bathroom looks fantastic. You did a great job with taking what you had and turning it into marvelous. It’s so funny how we all want what we don’t have. If you read our post today – we lament the fact that we no longer have a large tub and you want your kids to have a shower. LOL. That’s the great thing about doing-it-yourself and dreamers like us…we can make it happen! Both bathrooms look great! 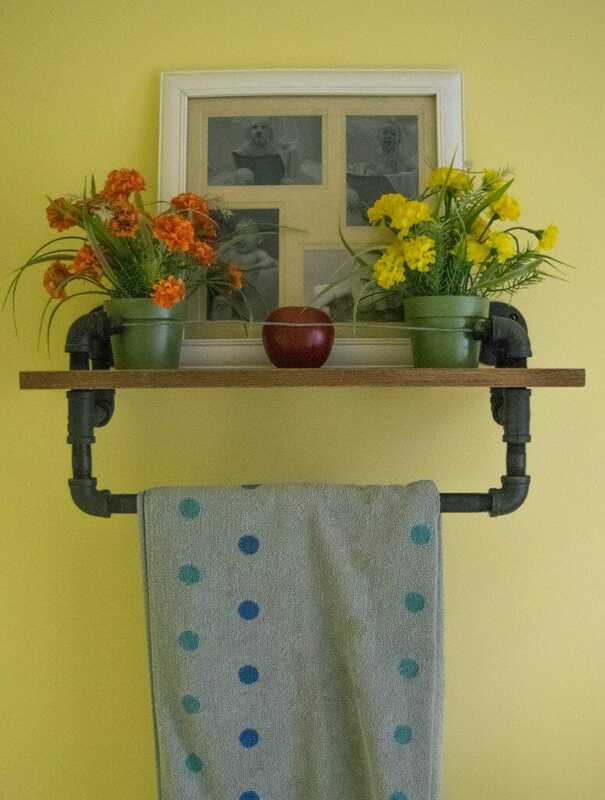 I am in love with the pipes being uses as hardware for the wood shelf. Super cute and creative while still looking classy. I love your house. It is so beautiful. You have really done a fabulous job on it. You did such an amazing job! It doesn’t even look like the same bathroom. I love it! I also really need to redo our guest bath and you’ve given me some great ideas! Wow you decorated it so nice. I love it. You did a great job on both bathrooms! I love the bright and cheerful colors! 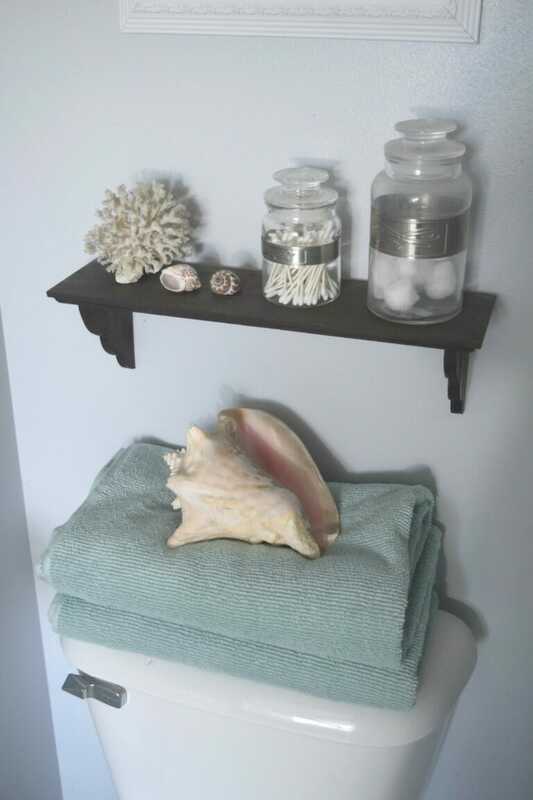 I especially love the “beach” theme…….just like my bathroom!! Big bathrooms are over rated…..too much to clean! Wow, you can tell how much work you put into updating these spaces. The bathroom looks fantastic! It really is a completely new space. You really brightened it up and made it completely modern. Looks great! What a drastic change! 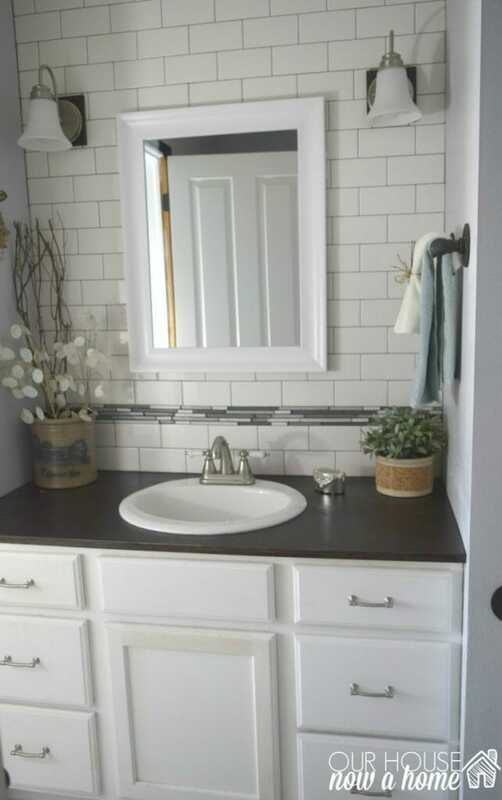 It looks great, love the tile and the clean look! Wow painting the cupboards really makes a difference. 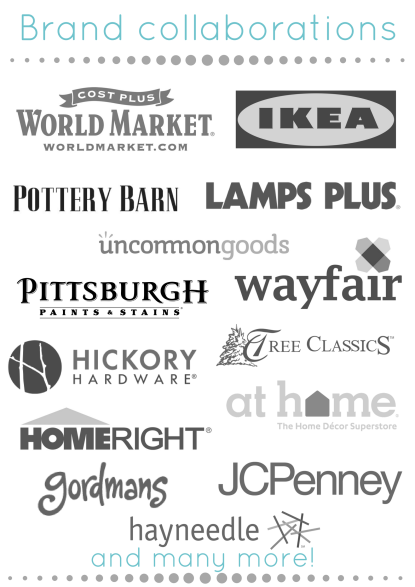 I have been thinking of freshening up my master bathroom this winter. This is a great series of posts. They both look great! I really love that white tile backsplash by the sink area! 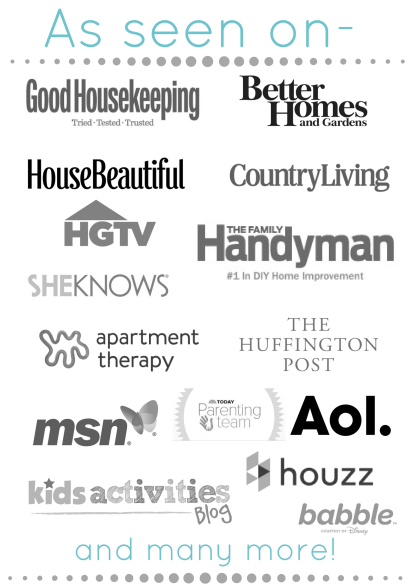 You did an amazing job on your bathrooms. I love how both turned out. They are brighter and look very relaxing. Wow what inspiration!! 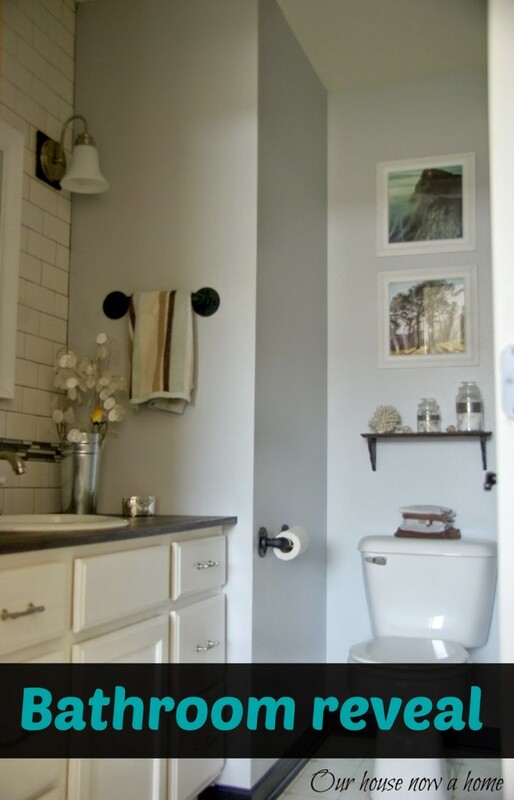 I desperately need to redo both of my bathrooms! This has helped give me some great ideas! I love your master bathroom update!! It’s super cute and very relaxing!! When can I move in? You kill me with all these great looks! I’m in need of an update when I get back from vacation for sure! What a great transformation. We’ve moved in to a new home and all the bathrooms are in need of make overs. I will keep all of these ideas in mind. Everything’s so lovely to look at! I’ve been thinking about what to do and how to design the master bathroom at home and this is definitely a lovely inspiration for that! Your house is beautiful! I think changing the wall colour in the yellow bathroom may be a great step. 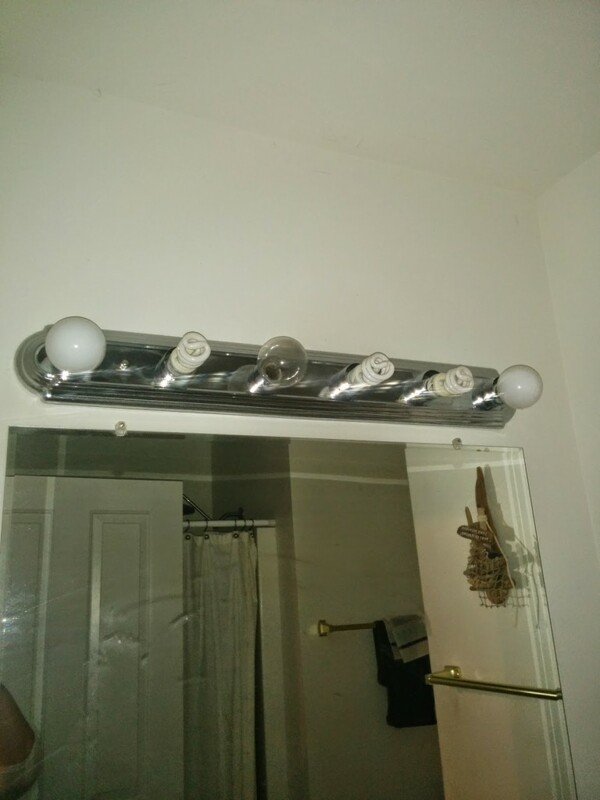 I mean it’s not TERRIBLE, I think it’s just too bright for a bathroom. I can’t wait to see what you do next. I love the tile! I love everything! Great transformation! I love the small changes that you made. It is amazing what a new coat of paint will do to a room. 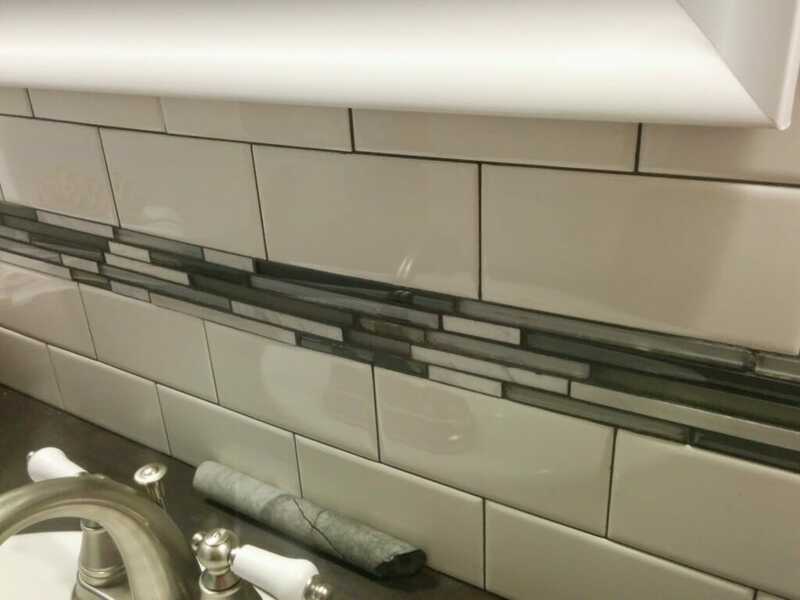 I also love the subway tile backsplash. 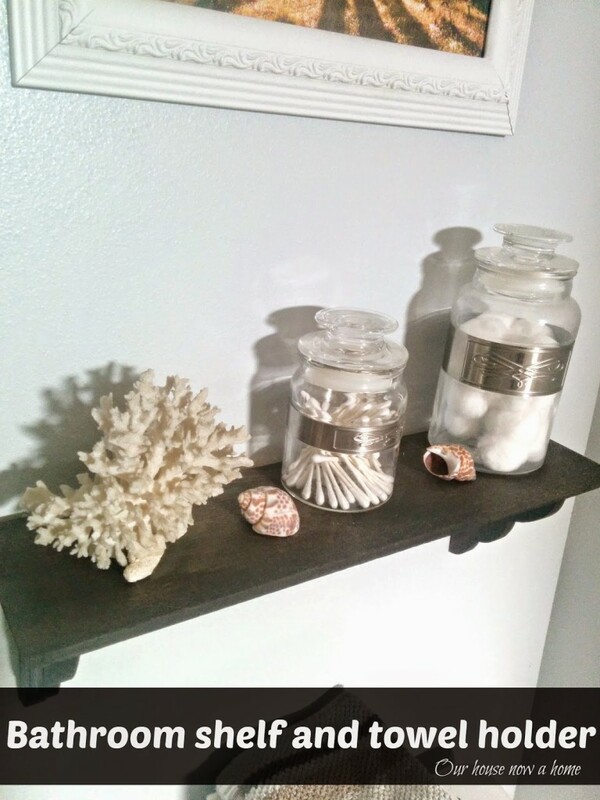 I watch a ton of HGTV and love getting design ideas even though we no longer own our home. It sounds like your shower is as small as ours! You sure did use the right colors to make it look bigger though! Your bathrooms look awesome! 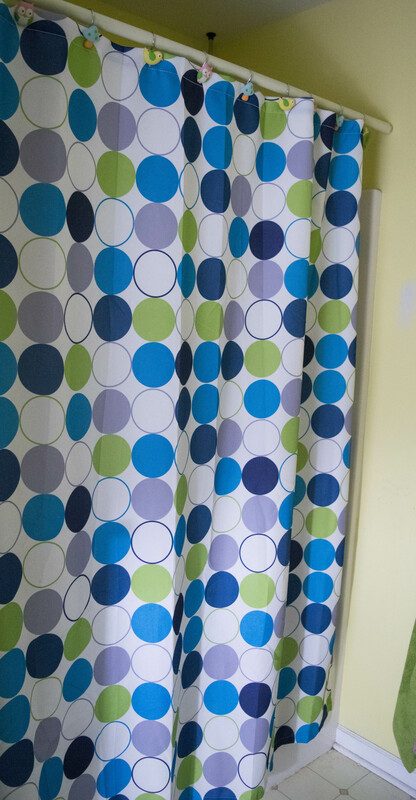 I love the bright circles on the shower curtain. You really gave that bathroom new life. 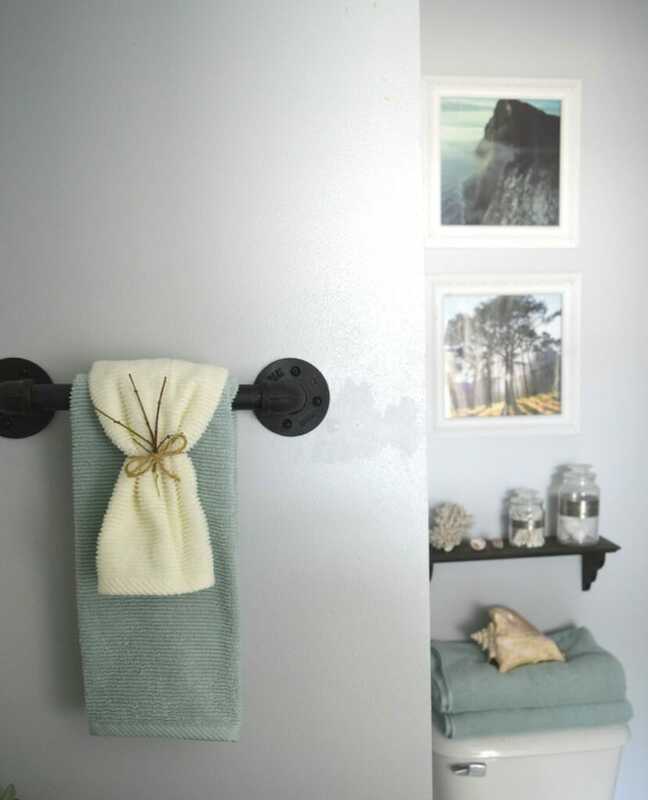 Grey is a prominent color in our home, it works so well in any space. You did a nice job, I love the tile. That really was a remarkable transformation. Kudos for a job well done! I like your style! Oh wow! I just love how you decorated the bathrooms! You’re so amazing at what you do! I think the master bathroom is such a lovely inspiration should we decide to redecorate in the future! OMG, what a transformation! 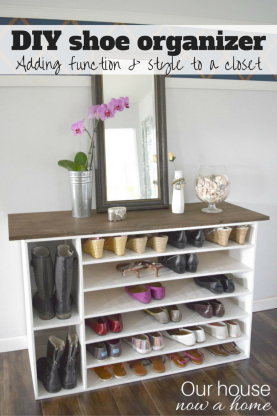 I love the stylish and design tricks you have used to make it look like a resort! This is a great place to enjoy your shower at, and to get that peaceful minute of your day that will take you to far away places – what a great job you have done, BRAVO! These are some serious inspiration. Can’t wait till I get get my own place. 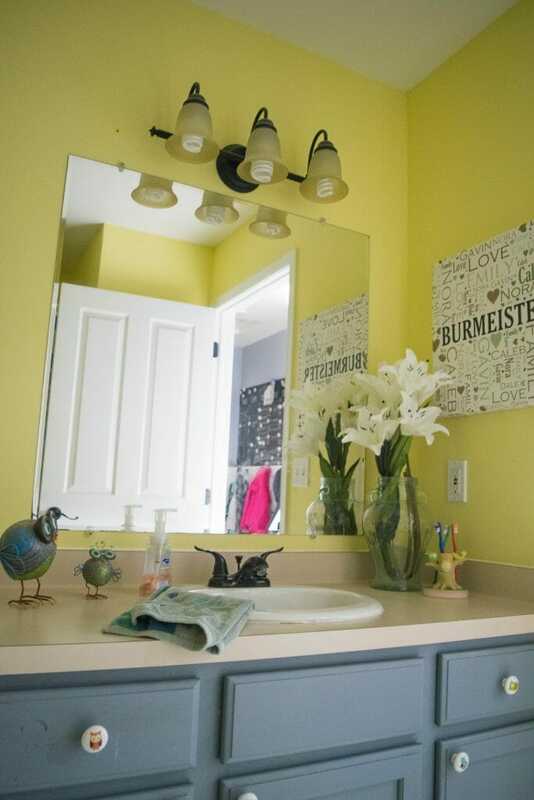 Love the yellow bathroom. I think you’ve done a fantastic job updating your master! 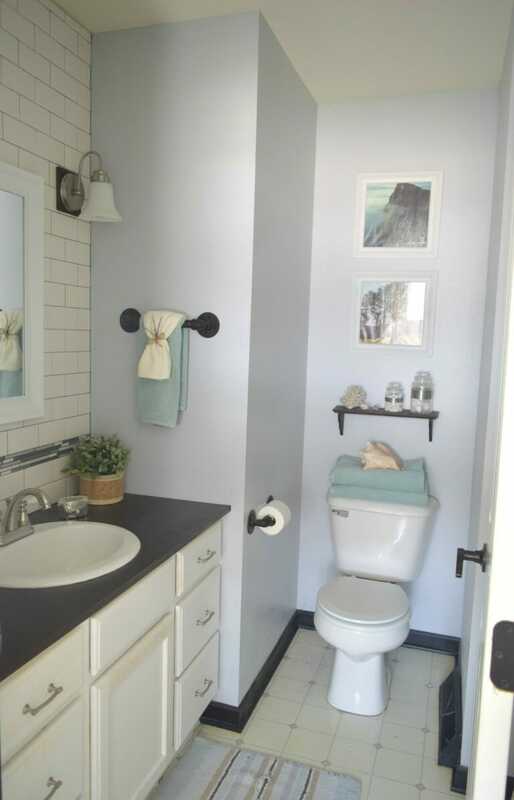 The color is so serene and I really like the vanity updates you did. 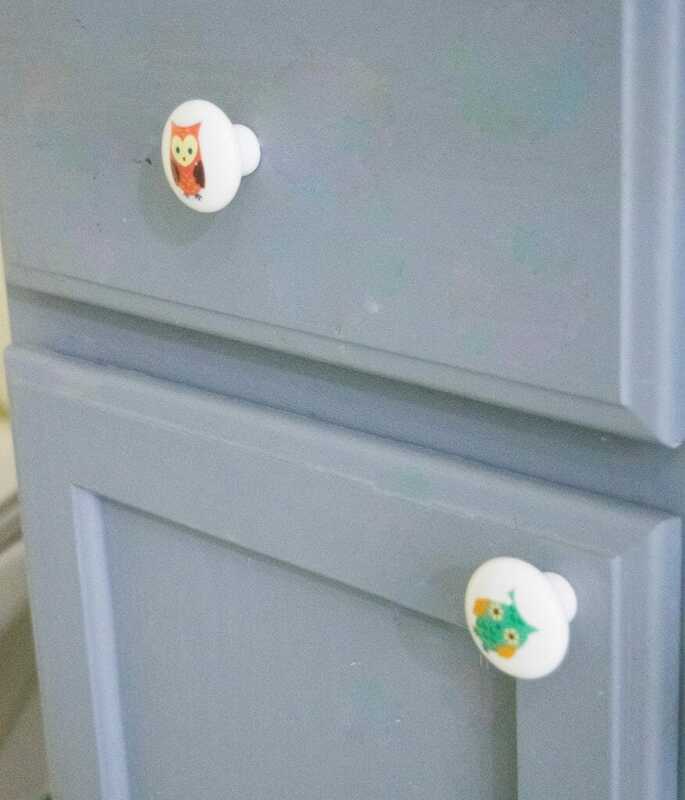 Using the cutsey owl theme and bold colors is really creative.